I have made a new pair of shorts. 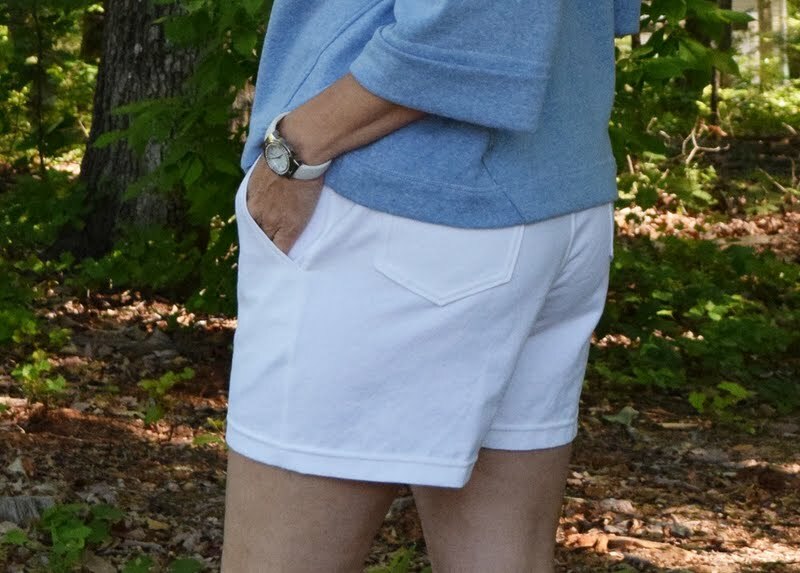 Last August my friend Sue, the always-inspiring creative talent behind Fadanista, blogged about her test versions of the then-newly released Itch-to-Stitch Belize Skort/Shorts Pattern and I did something I have NEVER done before. I immediately purchased the .pdf download of the pattern. Completely amazed myself with the quickness of that decision, but am glad I did as I needed an all around comfortable nice-looking shorts pattern. 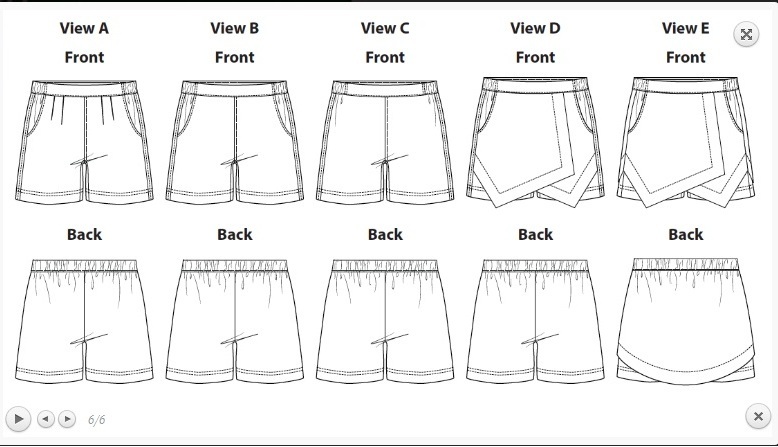 There are 5 different views within this one pattern..... a skort design as well as a couple of different shorts designs. I chose View B.... a simple flat front with elasticated sides and back. I also liked the layering feature which enabled me to only print the sizes I wanted.... AND the 1/2" seam allowances are already built in to the pattern. I followed the pattern's directions completely. Which also never happens. ;) After making so many Ottobre and Burda patterns recently with limited instructions, it was a luxury to follow the step-by-step instructions here. All seams are serged and then double-needle stitched down including the crotch seam. I really like this little added detail. My size fell between a 2 and a 4 and not wanting a lot of gathers at the back, still cut a 4 and regraded the waist a little smaller thinking I was being oh-so-clever.... but then cut the waist band a solid size 2.... and it fell short to match up properly. Not to worry, I simply took in a couple of darts on each side of the center back by folding them in and stitching and all worked well. I really like that these don't scream 'elastic-waist pants' all over, yet have the comfort of an elastic-waist pair of shorts. And oh the pockets! Great pockets! Nice and deep!! These were made straight from the pattern, with the exception of the slight waistline re-grading, so was curious to see how they would fit my backside..... a usual problem area for me..... and am finding this okay. Today they are being worn with an old Deer and Doe Plantain top, but I have a new coordinated top in the works. They seem a little short? Maybe? I may lengthen my next pair a little. And now for the rest of the story..... I struggled to find the right weight material I wanted to use on these as I did not want them to be too 'stiff', nor too 'lightweight'..... so after digging around in my stash that had been archived in a box years ago.... I found this floral cotton remnant that seemed a good weight to me. Excited that it measured the 1 yard needed to make this pattern, I could not understand why my pattern pieces were not fitting on my piece of fabric...... until I measured the width of my fabric and found this piece was a mere 34 1/2" wide!! Whuuuuttt?!!! Totally confused at this point I asked the sweet ladies of IG if this could possibly be a vintage piece and the resounding consensus was that it was. How cool is that?! 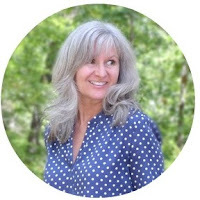 I learned from Carolyn, who blogs at Diary of a Sewing Fanatic, that most cotton fabric available in America measured @36" wide until the age of polyester, and then the widths changed to our now common 44/45" wide cotton fabrics. And this piece just seemed different.... the color saturation went all the way through the selvedge and the 'feel' of it felt finer than an ordinary quilting cotton. So there you go, I love the way stories are woven through the garments we make. Back in the 36 inch width days, you could actually get dressmaker's cotton, always nicer than quilter's cotton which is a much coarser cotton that does not have the drape and softness of dressmaker's cotton. You may find that the pattern is woven through, and not spray printed on. Anyway, enough about the fabric. The shorts are cute, a lovely little cut. And it is so easy to make a partial elastic waist band, is it not? Really cute Lisa.. 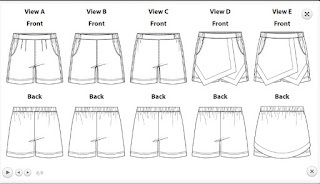 I have been looking for a shorts pattern like this.. Thank you for sharing.. Happy sewing. Very pretty shorts and a lovely fit. These shorts look truly fabulous. I love that summery material too.